Wikimedia Commons has media related to 1735. 1735 (MDCCXXXV) was a common year starting on Saturday (dominical letter B) of the Gregorian calendar and a common year starting on Wednesday (dominical letter E) of the Julian calendar, the 1735th year of the Common Era (CE) and Anno Domini (AD) designations, the 735th year of the 2nd millennium, the 35th year of the 18th century, and the 6th year of the 1730s decade. As of the start of 1735, the Gregorian calendar was 11 days ahead of the Julian calendar, which remained in localized use until 1918. January 2 – Alexander Pope's poem Epistle to Dr Arbuthnot published in London. January 8 – George Frideric Handel's opera Ariodante is premièred at the Royal Opera House in Covent Garden, London. February 14 – The Order of St. Anna is established in Russia, in honour of the daughter of Peter the Great. April 13 – Emperor Sakuramachi accedes to the throne of Japan. April 16 – Alcina, George Frideric Handel's Italian opera, premieres at the Royal Opera House in Covent Garden, London. May 22 – George Hadley publishes the first explanation of the trade winds. July 11 – Pluto (not known at this time) enters a fourteen-year period inside the orbit of Neptune, which will not recur until 1979. August 14 – Freedom of the press: The New York Weekly Journal writer John Peter Zenger is acquitted of seditious libel against the royal governor of New York, on the basis that what he published was true. October – War of the Polish Succession: A preliminary peace, ratified in 1738, is concluded. October 18 – The Qianlong Emperor succeeds his father, the Yongzheng Emperor, and begins a 60-year-long reign of the Qing dynasty. 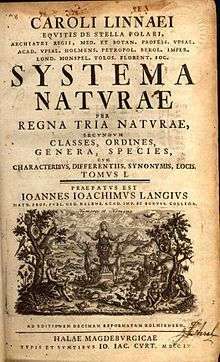 Linnaeus publishes his Systema Naturae. Russo-Turkish War, 1735-1739: Russian forces fail to occupy the Crimea due to rasputitsa. A shipbuilding industry begins in Mumbai. Leonhard Euler solves the Basel problem, first posed by Pietro Mengoli in 1644, and the Seven Bridges of Königsberg problem. The King's Highway (Charleston to Boston) is completed. Quebec: Construction begins on the Chemin du roy between Quebec and Montreal. Cobalt is discovered and isolated by Georg Brandt. ↑ Philosophical Transactions of the Royal Society (London) 39: 58–62. ↑ The Hutchinson Factfinder. Helicon. 1999. ISBN 1-85986-000-1.